Google's new Nexus 7 is an upgrade in virtually every respect over the 2012 version: it's lighter, thinner, faster, has a great screen and a camera. The screen, in particular, is fantastic. It's bright, colorful and at 323ppi the sharpest display available on any tablet - twice the ppi of the iPad Mini. Reading on the new tablet is particularly great, and still very readable at lower brightness levels. Likewise the sound on this new tablet is much improved over the older one, with new Fraunhofer drivers and better volume from the headphones compared to the 2012 machine. So to speak, the device absolutely rocks for watching new DVD movies. However, it only recognizes video and audio formats like MPEG4 and H.264, no DVD supported. Users need to rip DVD to a compatible video first, then transfer the output video and finally watch the dvd movies on new Nexus 7. There are many third-party programs out there that can make copies of DVD movies into desired video format. 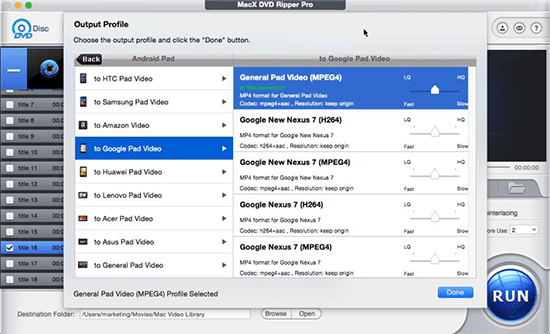 MacX DVD Ripper Pro (available for Mac or for Windows users) would be highly recommended. It is easy to use for ripping and editing and makes great quality copies of DVD movies. Besides, in support of CSS, region codes, RCE, Sony ArccOS, UOPs, Disney X-project protection, etc., this professional DVD ripper for Mac will make users free from the worries of DVD region restriction, copyright and encryption technologies. Rip DVDs incl. encrypted DVDs to Google Nexus 7, Google Nexus, Galaxy S7/S6, iPhone, iPad with No.1 fast speed and zero quality loss. First download the full version of this software (Mac version & Windows version) which has absolutely no restriction on ripping time, format and upgrade, (please make sure to download the right version according to computer operating system); then perform it on computer. Here is an example of ripping DVD to new Nexus 7 on MacBook Pro/Air/iMac 4K 5K. Import the new movie DVD releases you want to rip by clicking "DVD Disc" button or simply load DVD folder by clicking "Path" button. Here you can click "to Google Pad Video" and choose the video format H.264 or MPEG 4 as output video format. After finishing the above steps, click the "RUN" button to start ripping DVD to Google new Nexus 7 on Mac (including macOS Sierra, El Capitain). This updated DVD ripper is added with cropping, merging, trimming and expanding functions. Therefore, you can edit video and make the personalized DVD video before putting it on your new tablet. In addition to converting DVD to Google Nexus 7, this program works well to other devices, for example, import DVD to Apple iPad mini 4, iPad Air 2, iPad Pro, Samsung Galaxy tab, Mircosoft Surface 4, Acer Iconia tablet, iPhone 6s/Plus, HTC One M10 etc. Note: to put the converted DVD video into iPhone iPad iPod, you need download MacX MediaTrans to effortlessly transfer video from computer to iDevices for playback on the go. This tutorial focuses on how to convert videos like MTS MKV WMV MOV AVI FLV to Google Nexus 7 supported video format. Free download the video converter to transfer all videos to 7-inch tablet at lightning speed. Notice: We only advocate using this best DVD ripper to rip commercial DVDs to Google Nexus under the concept of Fair Use and do not encourage any illegal reproduction or distribution of copyrighted content. Please abide by the local DVD copyright law before doing it.